Firstly, a super quick apology for not having a new blog up yesterday evening. I normally aim to do two a day but yesterday I had other things on my mind and wanted to do this one with the one going out this evening. I recently mentioned in my minimalist v hoarder post that I was looking to get a lip butter to fill in an awkward hole in my drawers and mentioned I was going to be getting one. 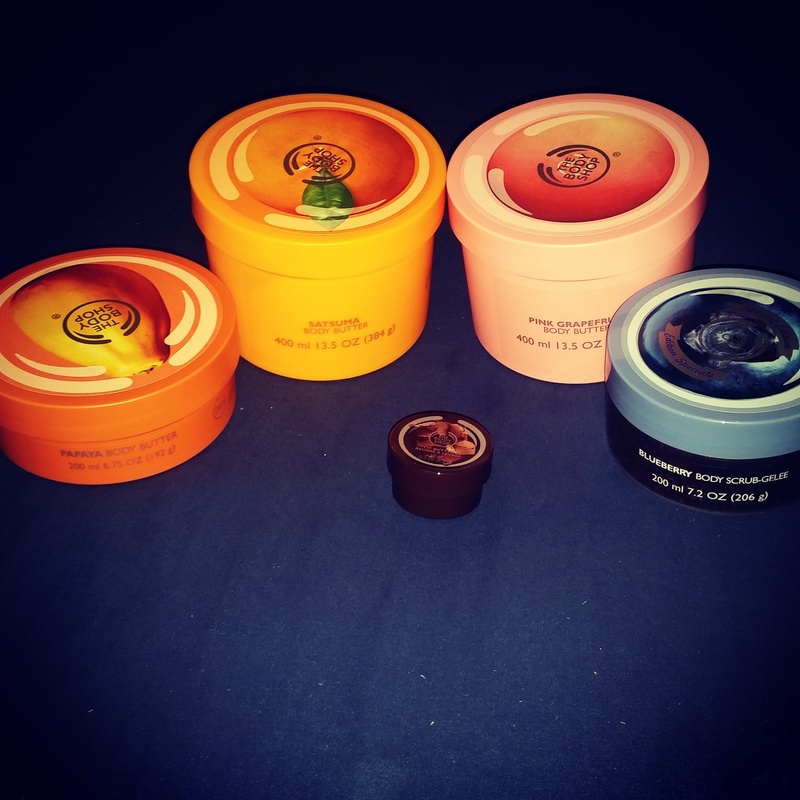 My friend had told me that the chocolate one was on offer at The Body Shop and they were going to be doing a little order so could get me one and give it to me at some point. On Thursday morning the doorbell went just before 9am and I was super confused. The postman just about manages 9.30am if the weather is dry and he doesn’t get held up at every house. I opened the door to a super friendly delivery guy who handed me a box and I was still none the wiser. Opening it up I found a satsuma 400ml body butter, a pink grapefruit 400ml body butter, a papaya 200ml body butter, a 200ml blueberry body scrub and a chocolate 10ml lip butter all from my friend (who wishes to remain nameless)! I literally just sat on my bed, still in my pjs and dressing gown, and cried for ages (and smiled lots too) at them caring so much and deciding to get me these out of the blue. I have a body butter supply that will last a long long time but I also have a friend that means more to me than any possession ever could. This entry was posted in Beauty, Skincare and tagged amazing, bath, bblogger, bbloggers, Beauty, beauty blogger, beauty bloggers, beauty product, body butter, body scrub, body shop, friend, gift, home, lblogger, lbloggers, Lifestyle, lifestyle blogger, lifestyle bloggers, lip butter, pampering, selfcare, shower, style, the body shop, treat. Bookmark the permalink.